To include a side on this list whose greatest achievement was to finish 7th one season may seem odd, but the final league table of the 2001/02 season doesn’t do justice to Bologna’s achievements that season – mixing it with the big boys, and only a final day defeat denying them the 4th place which cost them a place in the Champions League, at the expense of Milan – who went on to win the next season’s European Cup. 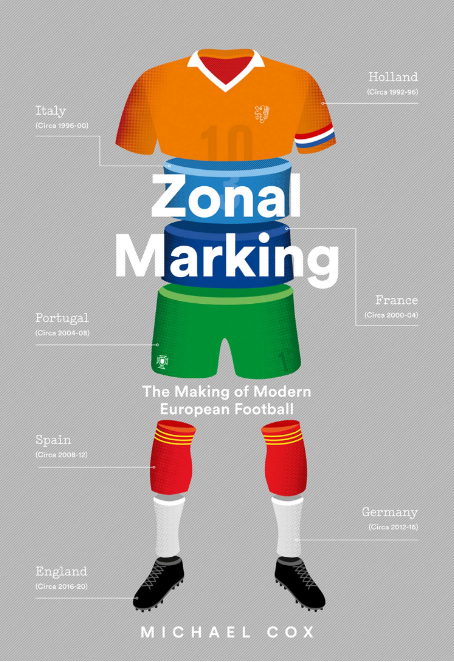 Their system was based almost entirely around Julio Cruz – a 6’3, awkward-looking Argentinean striker who had scored just seven goals in his opening season in Serie A, after moderate success with Feyenoord in Holland. Indeed, his goalscoring ability was so poor in his first season that he became a figure of fun amongst many observers, similar to how Emile Heskey has often been mocked in England. If Cruz couldn’t score goals, what was he doing playing as a striker? In fact, Cruz was vital to Francesco Guidolin’s system. Although his goalscoring return improved only slightly – to 10 – in 2001/02, Cruz was magnificent all season, and completely turned around opinion within the space of a year. His job was simply to compete with the opposition centre-backs, to hold the ball up, and lay it off to Bologna’s impressive attacking players, including Giuseppe Signori, Claudio Bellucci, Tomas Locatelli, as well as Fabio Pecchia and Lamberto Zauli breaking from midfield. 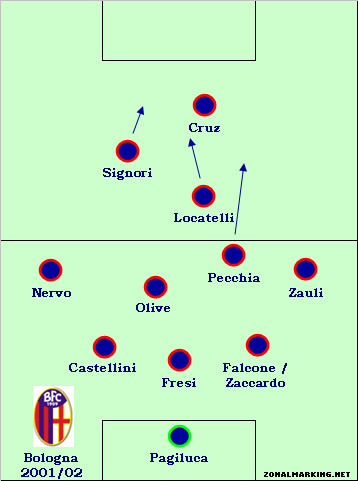 Cruz was hardly the first striker who was far from prolific and who specialised in holding the ball up, but Bologna’s success can partially explain the prevalence of one-striker systems towards the middle and end of the decade, particularly as it was so successful against the big clubs – Bologna beat both Inter and Milan at home, and drew with Juventus. 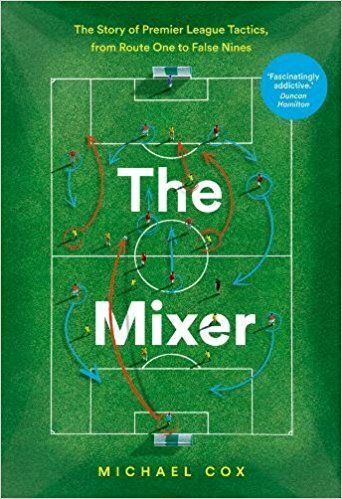 It bares a strong similarity to the system Fabio Capello has used with the England side, although Heskey still lacks the acclaim that Cruz eventually received. The other notable thing about Bologna’s shape was its ability to change completely from game to game, which makes it hard to classify them as playing simply one formation. Guidolin used 4-3-2-1, 4-2-3-1, 3-4-2-1 and 3-4-1-2 (although he favoured a three-man defence) and was happy to adapt his system according to the abilities of the opposition, which was part of the reason why Bologna performed so impressively against the big sides in the league. As you might expect, there aren’t too many YouTube videos of a scrappy side which nearly came finished 4th eight seasons ago, but this video shows what Bologna did well, at 1:15. Cruz wins the ball, lays it off to a midfield player, Zauli, who chips it through for Signori to exploit the space created by Cruz dropping deep, and Signori scores. Simple football that nearly – nearly – got a very average side a place in the Champions League. No comments on this entry? This particular entry on such a list is what makes this site so great. Who else would include this Bologna team in any end-of-the-decade list? Major props! This side was notable for its ability to get results against the big clubs in the league but I also remember them being pretty scrappy and adventurous, making them a lot of fun to watch. Ha, thanks! They were great – Signori was a legend, Locatelli was sometimes amazing, Pecchia was a smashing little player and I thought Cruaz was rubbish but he turned out to be quality! I came across this whilst looking up what Julio Cruz was up to these days, I knew he had transfered from Inter to Lazio, but had not heard his name for a while. 4 goals in 23 appearances is a disappointing return for someone who I always felt sorry that he never got more starts with Inter, when in truth he was always a more likely goal scorer than other strikers who got picked ahead of him (adriano, ibra). As the first poster said this is a suprise inclusion in your list, but I remember this team well, as an Inter fan. Did they not have Roberto Baggio on the squad at this point too?